Great action in this short, one-sided match. Dan DaLay and Derek Frost wouldn't allow their opponents any offence at all for a while, and they didn't get much in overall either. For the finish, DaLay hit the smaller one with a brutal 'DaLay Down' Headbutt. An impressive outing from Erik Strong here, going it alone for a change. But he was in there against the vastly experienced Lord James King. The crafty 'Gentleman', which is a nickname that simply doesn't describe him, attempted to use the brass knuckles behind the referee's back, but Erik Strong fired back with some knife edged chops, and King dropped the foreign object! For the finish though, King grabbed Strong's arm, and pulled him in for the 'King Maker' Lariat! Another big win for Lord James King, who had his hand raised in the ring... His rival, Wade Orson headed onto the stage with a microphone... Telling the 'Gentleman' not to panic... And telling him he just needs to hear what Orson had to say... Orson wanted a singles match against King... He's wanted it for a month now, since King decked him after their last 1 on 1 meeting... King said okay... Next week, tag team match... and if Orson's team wins, King will grant him his singles match!! Both teams worked hard in this match, but it was the teamwork and cohesiveness of the two members of The Shooters (Dean Waldorf and Marv Statler) that set them apart from their young, talented opponents: Sonny Wildside and Solomon Gold. The Ring Generals lived up to their name, and controlled the pace of the match well. They ended it with a 'Waldorf Salad Toss' on 9 minutes, despite a resilient performance from the young fan favourites! Sean Deeley sent Ernest Youngman to the ring, and instructed his Shooters to surround the ring, but hold back a little... Because he had something to say... Deeley told Sonny Wildside and Solomon Gold that there was a spot available in The Shooters, for a fifth member... and if the two of them fought right now, the winner could join his group, and sit under his learning tree... Wildside and Gold had better ideas though, and began fighting Dean Waldorf and Marv Statler!! Deeley nodded, and sent Youngman into the ring...!! This was a decent match for these two promising youngsters, right in the middle of the card. Mark Griffin had the killer instinct in the end, ending it with his 'Swinging Side Slam' and locking Hugh Ancrie in a tight cover to score the win. 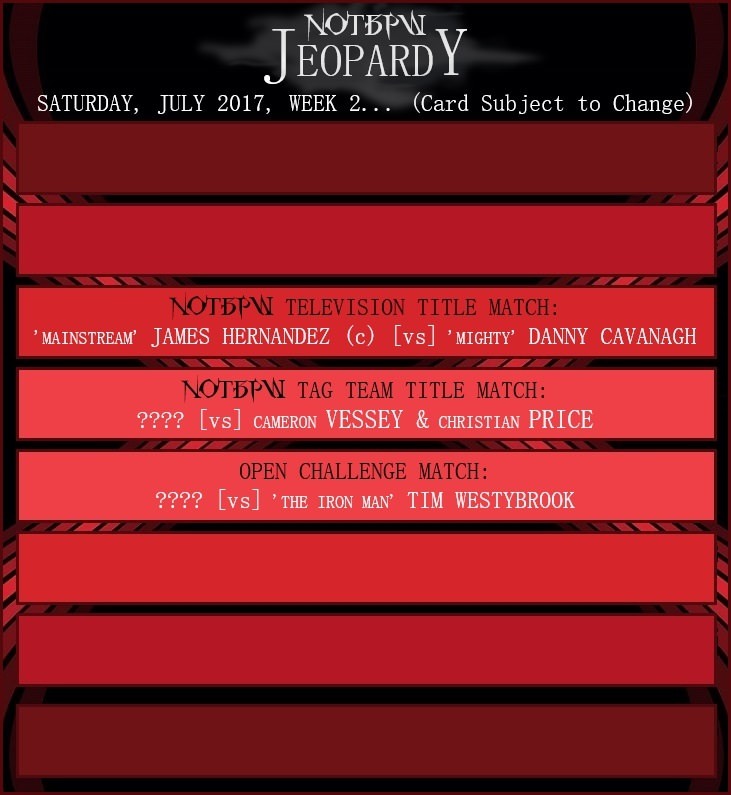 A very good co-Main Event in which either man could have won the match, and gone on to Jeopardy. Danny Cavanagh grounded Aaron Andrews, and used an almost perfect attack to keep the quicker Aaron Andrews on the back foot. The 'Mighty' big man and the brawler Andrews got into a fist fight late on, but the physical game suited Cavanagh more than it did Andrews. The 'Ace' needed to get inside Cavanagh's head but he couldn't. Cavanagh hit a throw on Andrews that sent him right across the ring and he hit the bottom rope hard! This lead to the 'Sit-Out Spinebuster' to end it! These two top tier talents looked like they'd been competing against each other for years. Their chemistry levels were very high, and they put on an excellent Main Event. Edd Stone attempted a low blow early on, but not only did the referee see it, but James Hernandez blocked it! For the longest time, Hernandez created some momentum due to some of his unique offence! He hit a variety of super kicks, and then flew over the top rope to land a suicide dive!! But Edd Stone looked in a defiant mood tonight, and looked like he was ready for anything. But James Hernandez is seemingly impossible to defeat lately. He waited until his opportunity, and then landed his 'Apparition #14' Spear!! Stood behind Edd Stone with a hood on was none other than SEAN McFLY!! Three months ago, Edd thought he'd gotten rid of McFly at the DeColt Wrestle Festival, but McFly is BACK!! He flew across the ring, closing the distance between himself and Edd in a fraction of a second... Edd was so shocked he bit his tongue, hard, and was bleeding at the mouth by the time McFly had finished battering his young brother-in-law with fists and forearms... McFly let Edd stand up, but the young Stone Brother slid out of the ring and sprinted away to the safety of the stage...!! Great way to end the show, but McFly will want more! !